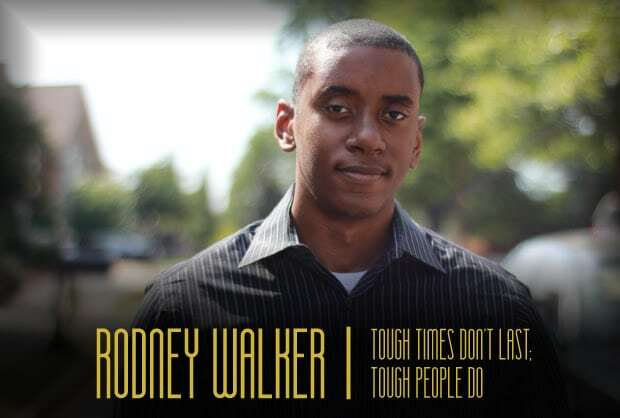 To say that Rodney Walker faced some challenges throughout his life is an understatement. Growing up on the southside of Chicago, he had some traumatic events happen in his life. From his father being incarcerated for drug use to being placed in 12 different foster homes throughout his childhood, Rodney had the choice to make. He could either let life happen to him, or he could find a way to learn, grow and persevere regardless of his past. With motivation from his mentors, Rodney embraced life and set out to reach his goals. He received his bachelor’s degree from Morehouse College, his master’s degree from Yale University, and he is now working on his Ed.D at Harvard University. Rodney now has a fundamental philosophy – our life’s outcome has very little to do with what happens to us, but a lot to do with how we respond. By illuminating the power of positive thinking and perseverance in the presence of life’s obstacles, he believes it will have a resounding effect on college students, everywhere. By sharing his story, he is helping students overcome their past and begin the healing process so that they can be successful individuals – in school, in business, and in their lives. Rodney Walker, a Chicago native, is the founder of Forever Life Productions, a company that creates custom videos for special occasions and events. Along with his production company, Rodney travels both nationally and internationally, speaking at public schools, corporations, and conferences about the importance of education, entrepreneurship education, mentoring at-risk youth, and corporate philanthropy for nonprofit organizations aimed to uplift and support at-risk youth. Given the obstacles placed before him as a foster child, Rodney struggled academically and socially in school. In his early years of elementary school, he was placed in special education, repeated the fourth grade due to poor academic performance, and underperformed with a sub-1.5 GPA in his freshman year of high school. But despite it all, Walker became an award-winning entrepreneur, with a bachelor’s degree from Morehouse College, and a master’s degree from Yale University – all before the age of 25. Rodney is the bestselling author of the educational memoir titled A New Day One: Trauma, Grace, and a Young Man’s Journey from Foster Care to Yale, available on Amazon and in all major bookstores nationwide. In an effort to address the epidemic of violence and social failure among at-risk youth in Chicago, Walker has partnered with former U.S. Secretary of Education Arne Duncan to create a comprehensive employment pipeline program for disconnected youth across the city. This fall, Walker will be pursuing his Doctorate in Education at Harvard University. Growing up in a violent neighborhood on the Southside of Chicago, Rodney faced tremendous adverse childhood experiences growing up in 12 foster homes. But through perseverance and mentorship, he became highly determined and resilient and went on to graduate from Morehouse College and Yale University. Now, Rodney is a Doctoral student at Harvard University. In this keynote, Rodney speaks to students about the pain and struggles he faced throughout his life that led to him becoming the stronger, more determined, and successful person he is today. Student audiences will leave the program with the understanding that their past does not define their future and they can persevere through anything life throws their way. The saying is true. T.I.M.E. (used properly) heals all wounds. In this keynote, students will be able to hear Rodney’s story of being a foster youth who graduated near the bottom of his high school class, who went on to graduate from Yale with a master’s degree by the age of 25. He shares the trauma that he experienced as a child and how he was able to start the healing process and reach his dreams, including the in-school mentorship program that inspired him. Now, he wants to pay it forward by supporting others who may be facing some traumatic circumstances. Students will have the knowledge and tools to start their own healing process and become mentors in their own communities for other who may need support. the strategies used to build an environment of empathy and compassion in their respective school environments. Going down the wrong path is tragic, but not because of one’s deliberate choosing to; it’s because most people never had a plan, to begin with. They let life happen to them, and life dealt them unfortunate circumstances. When you’re born in volatile conditions and circumstances, you can’t afford to let life happen, or to “go with the flow.” Having a vision, plan, and commitment to action is the only way to ensure you don’t fall victim to life’s inevitable circumstances. The purpose of the BOLD Leader program is to teach the entrepreneurial mindset in a critical way. This keynote aims to critically engage students by shifting their focus from the outside distractions of life to their own personal growth and development. BOLD stands for the Business of Life Development. Students learn how to create a comprehensive business plan, but not for a product or service; it’s a business plan for their life. how to understand their lives from a “business” standpoint; they will understand the importance of good decision-making, and why it’s important to invest in their own growth and development. Copyright © 2018 CAMPUSPEAK All rights reserved.